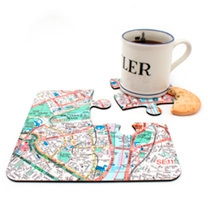 Four jigsaw coasters fit together to show a map centred on your home, that can then be used as a placemat. Surface scratch and heat resistant, 10 x 10cm. London Street Map Style (scale 1:12,000 - only available for Greater London inside the M25). Personalisation: Address and postcode. Quirky, personal and useful - the perfect gift!